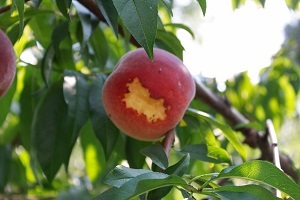 From time to time, backyard orchardists can have problems distinguising whether a disease, pest or something else is causing problems in the orchard. 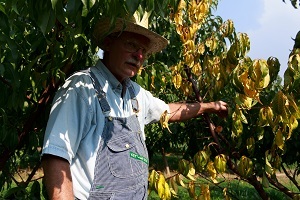 For beginier and experienced fruit growers alike, it is important to diagnose the problem before seeking a solution. 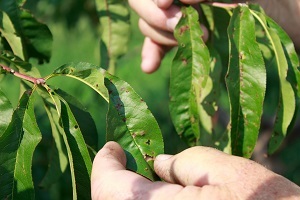 There are many resources online that can help with diagnosing fruit tree diseases and pests. 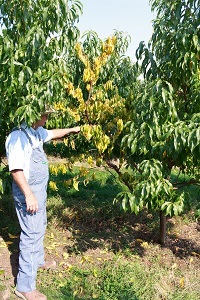 Just search for the name of your fruit tree, with a few words describing the problem, and click on Google images. if you don’t find what you are looking for, one very useful application for your phone that is free, and developed by biologists at Penn State University, is Plant Village (www.plantvillage.org). Or, if a more definitive diagnosis is what you need, you can turn to Michigan State University’s Diagnostic Services at www.pestid.msu.edu. 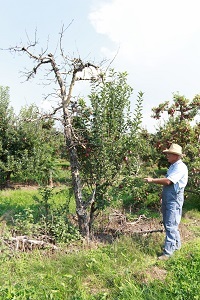 Below are a few photos from Grandpa’s Orchard that show just a few different examples of damage and disease that can affect your backyard fruit trees. 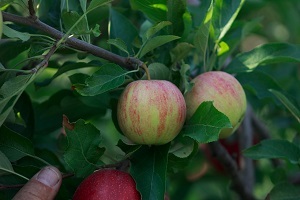 A Red Gala apple reverting back to its original less red origin. This is not a disease, but a genetic reversion affecting usually just that limb. Brown rot has overtaken and destroyed the fruit in the center. 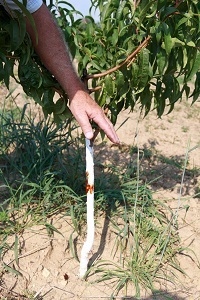 Regular fungicides sprays will help to prevent, but also remove any affected fruit from the orchard. 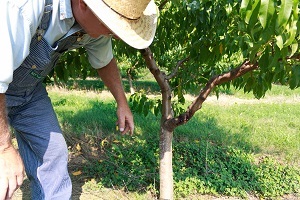 Brown rot will start as a very small spot on the fruit and continue to spread until the fruit is destroyed. 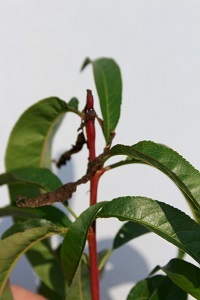 Typical shoot damage on a peach from Oriental Fruit Moth. The moth lays its eggs in the tip and the hatched larvae bores down the stem. 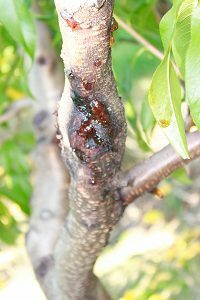 Other fruit moths may also cause similar damage on other fruit trees. Spraying with a pesticide early during the first hatch of moths will help to control, but these pests are difficult. Usually damage occurs periodically during the summer according to local populations and hatch rates. This could be damage from either winter injury or trunk borers. Closer view of damage from either trunk borers or winter damage. 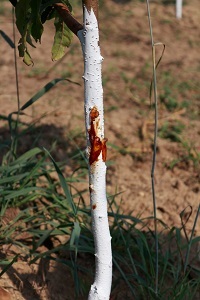 Canker starting on a peach limb. 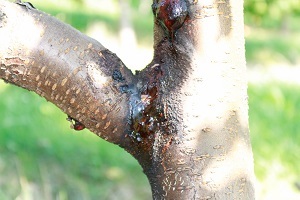 Canker usually starts from a small injuries like insect borers, physical damage, or winter injury. Good wide crotch angles for scaffold limbs helps reduce the chance of canker disease starting. 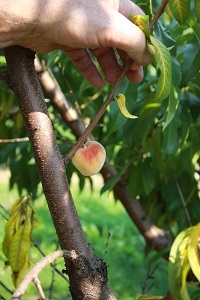 This is a pretty good example of a scaffold limb to try to have on stone fruit. Canker starting up in the angle of the crotch. Even though this is a pretty good wide angle, disease can start from insect or winter injury often times. Often winter injury and canker can go hand in hand. Regardless of the cause a severely damaged limb will eventually start to decline and eventually die. 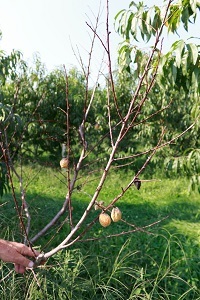 A “mummy” fruit caused by failure of the peach to be properly pollinated. These fruits will never develop properly and should be removed if possible as they often brown rot. 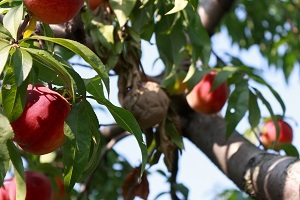 A closeup view of a declining peach limb caused by winter injury or severe canker killing the limb over time. Grandpa suspects that the older part of the tree was severely affected by fire blight and died, but a new sprout surprisingly has grown from the base. Bird damage of a peach. Birds are attracted for both the sweet food value of the fruit and during drought for the moisture when there are no other sources of water easily available. 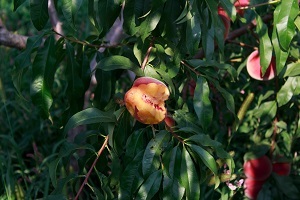 This peach limb bloomed and set some fruit in the spring, but hidden winter injury caused it to die later in the spring likely when hotter weather caused more stress and the vascular tissue of the limb couldn’t supply moisture and nutrients anymore. 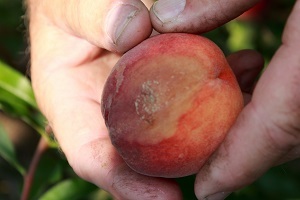 Bacteria spot is very common on most peaches and nectarines to some extent. Leaves are infected by the bacteria often by wind-brown sand. Fruit can also be affected too in more severe cases. There is really no cure and control can be difficult for the back yard grower. Keeping trees in sodded areas helps to reduce the amount of wind blown debris that can spread the disease. Most likely a raccoon or some other critter was feasting on this peach!